This site focus on the internal communication. Our listings of types of communication medium therefore exclude external media. With physical media we mean channels where the person who is talking can be seen and heard by the audience. The whole point here is to be able to not only hear the messages but also to see the body language and feel the climate in the room. This does not need to be two-way channels. In certain situations the receiver expect physical communication. This is the case especially when dealing with high concern messages, e.g. organizational change or down sizing. If a message is perceived as important to the receiver they expect to hear it live from their manager. Large meetings have got great symbolic value and should be used only at special occasions. This channel works very well when you need to get across strategic and important messages to a large group of people at the same time, creating a wide attention, get engagement or communicate a sense of belonging. Large meetings are excellent when you want to present a new vision or strategy, inform about a reorganisation or share new values. The opportunity for dialogue is limited at large meeting, of course but you can create smaller groups where dialogue can be performed. In the weekly meetings you and your group communicate daily operative issues, gives status reports and solves problems. Weekly meetings are also used to follow up on information from large meetings, management team meetings etc from a “what’s-in-it-for-us-perspective”. This type of smaller group meetings gives good opportunities for dialogue. This channel is often the most important channel you have as a manager, because that’s where you have the opportunity to build the big picture, you can prepare for change, you can create ownership of important strategies and goals etc. This is a favourite among the types of communication medium. This is a form of meetings where, often, a senior manager meets with a “random” selection of employees to discuss and answer questions. Some managers use this as a on going activities on a monthly basis. It can also be used in specific projects or campaigns e.g. launching new strategies. Or viral marketing as it is also called works external as well as internal and refer to marketing techniques that use pre-existing social networks to produce increases in awareness or knowledge through self-replicating viral processes. It can be word-of-mouth delivered or enhanced by the network effects of social media. The second of the two types of communication medium is mechanical media. With mechanical media we mean written or electronic channels. These channels can be used as archives for messages or for giving the big picture and a deeper knowledge. But they can also be very fast. Typically though, because it is written, it is always interpret by the reader based on his or her mental condition. Irony or even humour rarely travels well in mechanical channels. E-mail is a good channel for the daily communication to specific target groups. It is suitable mainly for up-to-date and “simple” messages and where there is no risk of misunderstanding, E-mail is an important supplement to weekly meetings and the Intranet. Invitation to and agenda for meetings can with advantage be sent out with e-mail before the meeting, while background facts and minutes from meetings is well suited to be stored on the Intranet. Write short and to the point. Target your messages to the audience and avoid sending unnecessary all-employees-e-mails. Set up your subject line to describe what the e-mail is about. Clearly state if the message is for information or for action. Avoid attaching large documents if possible. Post a link or direct to the source instead. Managers that have large groups of employees and who has difficulties in meeting all of them often choose to publish a personally weekly letter. It is sort of a short summary of news with personally reflections. Many employees often appreciate it because it has the potential to give the “what’s-in-it-for-us” angle. They can also contain summaries and status in tasks, projects or issues – yesterday, today and tomorrow. At special occasions it can be justified to send a personal letter to employees in order to get attention to a specific issue. E.g. pat on the back letter after extra ordinary achievements. Or it can be a letter with your personal commentary on an ongoing reorganisation that affects many employees. One other example is a letter that summarizes the past year and wishes all the best for the holidays. One of the most forgotten types of communication medium is clearly the billboard. Especially today, when everything is about social media. But the good thing with the billboard is that you can use billboards to inform people who does not have computers and/or access to the Intranet or to reach people that work part time and does not attend weekly meetings. The Intranet is of course one of the most used types of communication medium and a very important communication channel and work tool for you as a manager, but it is also your job to help your employees prioritise and pick out the information on the Intranet, as well as translating messages into local consequences. Ask your self: what information concerns you employees? In what way are they concerned? How do I best communicate this to my employees? Weekly meeting or your weekly letter can be a suitable channel to discuss or inform of information found on the Intranet. A Magazine offers the opportunity to deepen a specific issue, explain context, describing consequences or tell a story. It also has the opportunity to reach many employees. If you want to create a broad internal understanding of strategic messages the magazine can be a good vehicle to use e.g. by writing an article based on an interview with you. As were the case with the Intranet you also have to “translate” the information in the magazine to your employees. You can ask yourself: What does the content in a specific article mean to us? How shall I best communicate it to the employees? Or text messaging to the mobile phone is one of the new types of communication medium and not a very widely used channel but where it is used it is proven very effective. Some companies use it as an alert system e.g. for giving managers a head start when something important will be published on the Intranet. The advantage with Sms is that it is fast. But it should be used rarely as an exclusive channel. Some companies use it as a subscription tool where you can subscribe to e.g press-releases. More and more companies are using social media in their external marketing, setting up twitter and Facebook accounts etc. But these channels are also used internal where managers become “friends” on Facebook with their employees or where managers use blog and twitter targeting their employees. 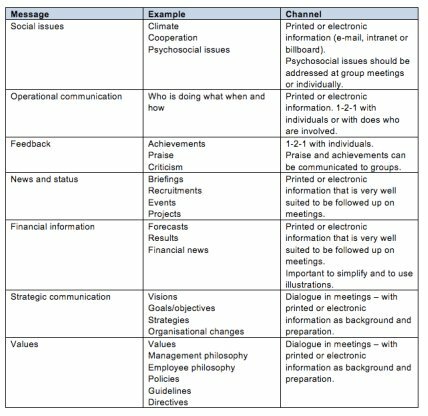 You can also divide the different types of communication medium in Push or Pull channels. Push channels are channels where the sender are pushing the message to the receiver. Meaning it is up to the sender to control the communication. Pull channels on the other hand is when the receiver is pulling the message from the sender. It is up to the receiver when he or she wants to take in the message. Push channels are often regarded as having higher reliability than pull channels because of the fact that it is more active in the communication. Choosing the right types of communication medium is first and most about understanding your ambition with the communication. What effect is you looking for after you have communicated? 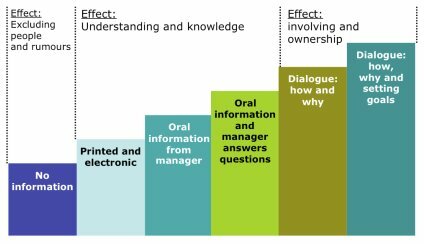 Increased knowledge, better understanding more motivation or involvement, or do you want it to lead to some sort of action or changed behaviour? The Ambition Stairway is a useful tool for you to use when deciding what channels to use for your level of ambition. Witch gives you control of the different types of communication medium. Also, it is important to realise that just publishing something on the Intranet will not get employees motivated and involved.